Manufactured from hi-impact co-polymer polypropylene. Large tilt opening parts bin. Sliding drawers with locking mechanism to prevent the drawer opening whilst in transit. Top carry handle with soft touch grip zone and large locking clasps. Internal four compartment tote tray. 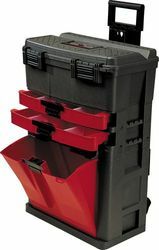 Top box and parts bin both feature aligning holes to suit padlocks with shackle diameters of up to 7.4mm. Metric graduated V-groove in the lid securely holds work piece while being cut. Trolley handle is height adjustable. Rear ‘H’ hooks for storing extension leads and large wheels for easy movement.Dimensions (W x D x H):490 x 330 x 720mm. Looking for Material Handling Cabinets ?